The Naumburg Cathedral of St Peter and St Paul is one of the most significant edifices of the European High Middle Ages – an outstanding architectural ensemble of cloister, cathedral garden and curia building. The late Romanesque/early Gothic cathedral is located in the south of Saxony-Anhalt directly on the Romanesque road. The landmark of Naumburg on the Saale is world famous due to its outstanding artworks such as the depictions of founders in the west chancel, the masterly Passion reliefs and artistic stained glass windows from various ages. Now a major restoration is about to take place of the windows that are mostly centuries old. This challenging project is to be overseen by an international committee of academics, consisting of art historians, natural scientists and restorers. 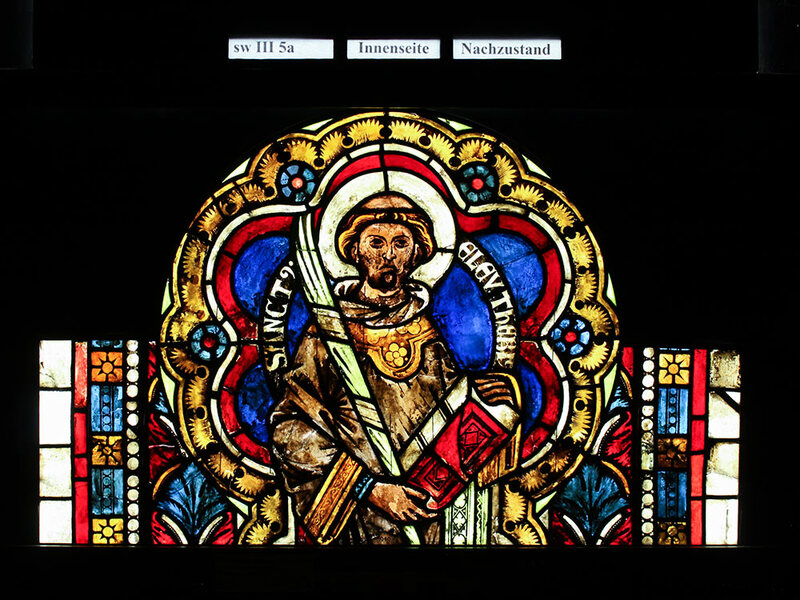 A total of nine panels from a window located in the west chancel were restored. As examples of the complete collection in the west chancel, these were medieval panels, a medallion from the year 1875 and four ornamental panels, which were only added in the years 1939 to 1942. This resulted in a sample grid for the impending total restoration, which also included sampling of the various types of protective glass and their installation. 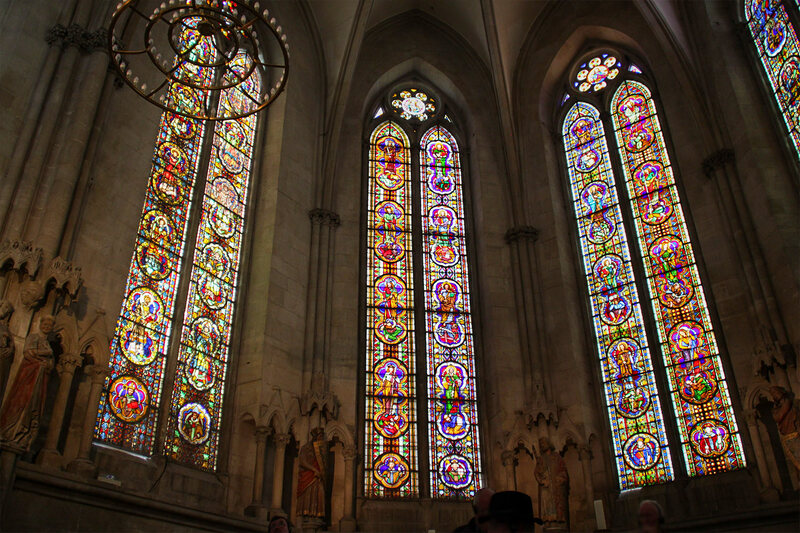 The condition of the five windows varies; three of the windows were mainly created around the year 1250. 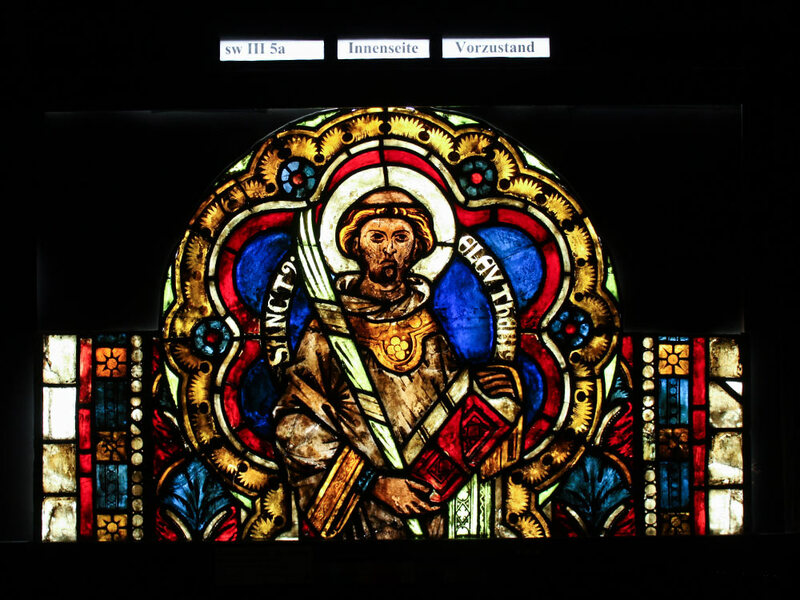 In addition to the windows dating from the Middle Ages and the additions made to them subsequently, two complete windows also exist from the first restoration campaign of 1875–1876 as well as other restoration campaigns of 1939–1942 and 1959–1967. The condition of the windows and the visible damage in each case therefore turn out to be very different. Some completely different restoration materials were used, of which the medieval sections are especially affected. 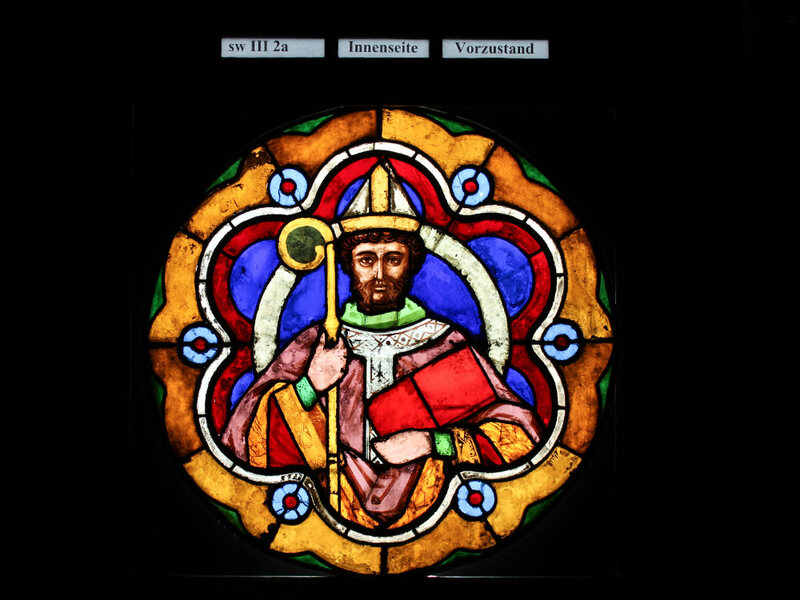 The stated objective of the restoration was therefore to gain a precise overview of the various visible conditions and damage, especially to do justice to the historic significance of the windows as well as the entire Naumburg Cathedral. Various treatment options were tested in the process in order to be able to weigh up exactly which solutions should ultimately be considered for the total restoration. The medieval panels had paint surfaces on their interiors that were acutely at risk of being lost. These had to be secured expensively and extensively; even when cleaning the surfaces, great caution was therefore advised. 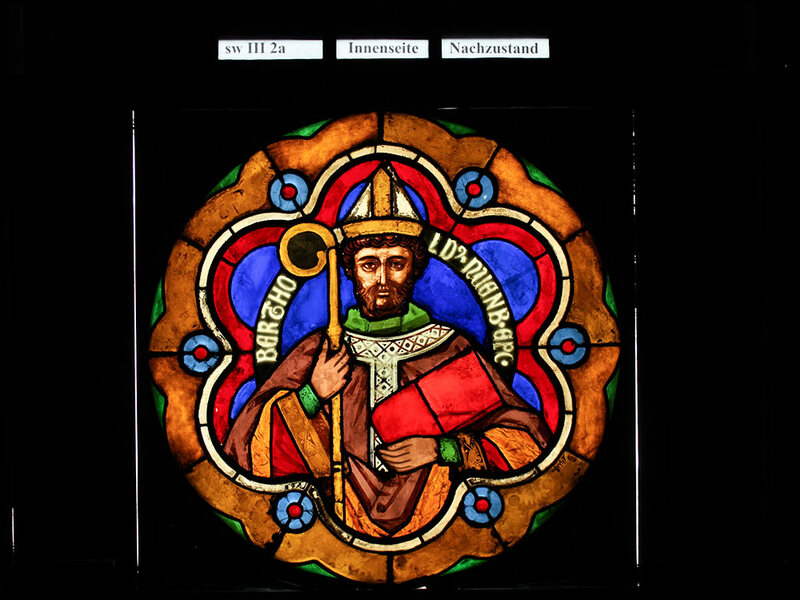 It was possible to remedy partly severe corrosion of the glass on the outside by means of careful thinning – with the result that a visible lightening of the affected areas and sharpening of the ornamental painting were achieved. 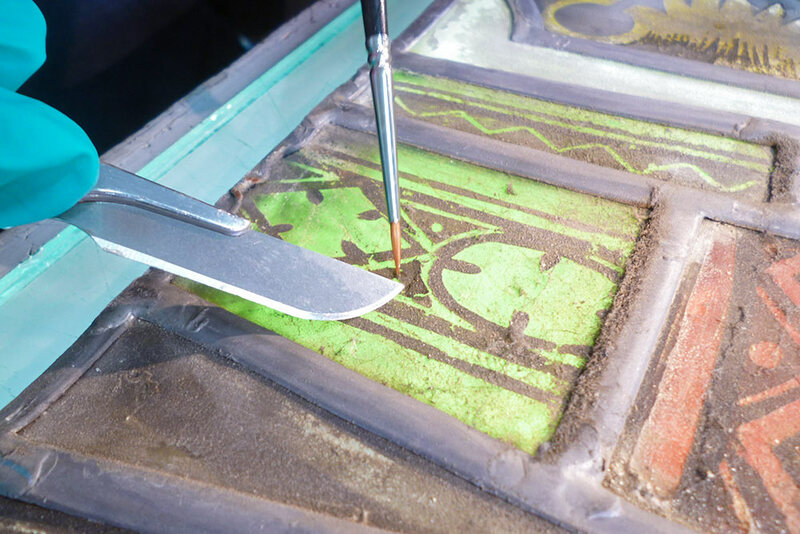 Panes of the bishop’s medallion from the 19th century had craquelure. Due to production-induced tensions in the material, the glass often had an appearance that was flawed and covered in tiny cracks. The damage was already so advanced here that minor defects had formed. Plus, further fragments threatened to fall out. The affected panes were therefore secured on both sides with glass fibre fabric – a method, which had already proven to be successful in an extensive research project at Cologne Cathedral. The original painting for the most part no longer existed. A restoration of legibility was enabled in important areas. For example, around the hands and scroll, new panes were painted, fired and attached to the outside. Plus, the entire glass area of the panel on the outside was provided with an additional circular pane – the corresponding area was definitely brighter than the surrounding ones and was therefore darkened using a tint on the previous protective glazing. The new pane was given several coatings to compensate for the different colour and brightness levels within the original area, which were the result of paint losses and later additions.